1. Shoes must be worn at all times. Sandals must have heel straps. Thongs or backless shoes or sandals are not acceptable. 2. Clothing, jewelry and personal items (backpacks, fanny packs, gym bags, water bottles, etc.) shall be free of writing, pictures or any other insignia which are crude, vulgar, profane or sexually suggestive; which bear drug, alcohol or tobacco company advertising, promotions and likenesses; or which advocate racial, ethnic or religious prejudice. 4. Clothes shall be sufficient to conceal undergarments at all times. See-through or fish-net fabrics, halter tops, off-the-shoulder or low-cut tops, bare midriffs and skirts or shorts shorter than mid-thigh are prohibited. 5. 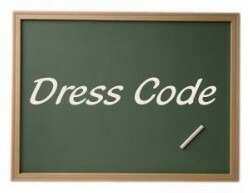 Gym shorts may not be worn in classes other than physical education. 7. Dark glasses shall not be worn indoors, except for valid medical reasons authorized by the administration and verified in writing by a physician.